The Federal Point Historic Preservation Society will hold its monthly meeting on Monday, July 20, 7:30 pm at the Federal Point History Center, 1121-A North Lake Park Blvd., adjacent to Carolina Beach Town Hall. 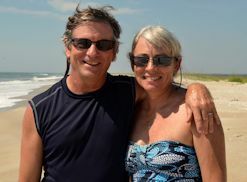 This month Peter and Cathy Meyer will present “Coastwalk North Carolina.” The program will chronicle their walk along North Carolina’s barrier island beaches. In all, the Meyers walked 425 miles, starting at the South Carolina border and finishing at the Virginia border. Enjoy the story of their hikes, along with the observations and discoveries the authors make along the way. They will use photos and video clips to bring their trip into sharp focus. Journey with the Meyers, and become inspired to take your own coastwalk of North Carolina. Peter grew up in Columbus, Ohio, the youngest of four children, three of whom went to medical school following in their surgeon father’s footsteps. Peter received his bachelor’s degree in zoology from Miami University in Ohio and his doctor of medicine degree from Ohio State University. After his residency at Bowman-Gray Hospital in Winston-Salem, he accepted a position as emergency room physician at Cape Fear Hospital. More than 20 years later he left the hospital and was Student Health Center physician at UNCW for seven years. Cathy grew up in Fairmont, West Virginia, the third of four children. Cathy and two of her siblings entered the medical profession following their mother who was a nurse. Cathy received her training at Fairmont State College then continued taking classes and earned a bachelor’s degree in English, concentrating on technical writing. When she came to Wilmington to visit her brother, Cathy fell in love with the coast and accepted a position at Cape Fear Hospital. Within months she began working at New Hanover Regional Medical Center. She had met Peter at Cape Fear Hospital but didn’t see him at a social event until seven months later. Now they’ve been married 29 years. Starting from the South Carolina border on Sunset Beach, the Meyers used cars, boats and ferries to access the islands until they reached the northern end of the Outer Banks at the Virginia border. The Meyers broke the trip up into segments, and the entire hike took 18 months to complete. They reached the Virginia border sooner than 18 months, but they had to return to some of the islands they were forced to skip along the way due to logistical issues and weather. An e-book (in 4 volumes) of their trip is available for download at: www.aviancetaceanpress.com .